Did You Adopt a Cat or a Kitten from an Animal Shelter? If you’ve just adopted your cat, you should be pleased with your decision. Even though cats are the most popular pet in the United States, many still end up in animal shelters and humane societies. So by adopting your cat, you’ve given your new kitty a second chance at a great life. Cats are amazing creatures. They are beautiful, graceful and intelligent. Of course, as anyone who lives with a cat will tell you the old saying is true: “dogs have owners, but cats have staff.” But those of us who understand and appreciate the cat’s independent nature realize that it is just part of the joy of living with a feline. After all, few things rival the serenity of sitting with a warm, purring cat on your lap. Cats can be incredibly loving creatures. And almost nothing in the world is cuter than a tiny, fuzzy kitten zooming around and tripping all over himself playing with a toy. Having a cat in your house can be an endless source of entertainment, amusement, and furry companionship. Of course, cats are not little humans in furry suits. Even more so than dogs, cats live in a world that is driven by sensory perceptions no human can truly understand. The fact that feline senses are so different from humans is a primary reason their behavior can be puzzling to us. Cats may seem mysterious and unpredictable to you, but the truth is that to a cat, everything she does makes sense. A lack of understanding of feline behavior is why many cats end up in animal shelters in the first place. You don’t want your new cat to end up back there and there’s no reason for that to happen. The reality is that once you understand feline motivations and behavior, you can more easily solve problems that arise. Many shelters don’t have the resources to give out a lot of information with every cat they adopt. That’s why I wrote Happy Tabby: Develop a Great Relationship with Your Adopted Cat or Kitten. My name is Susan Daffron and am the author of Happy Tabby. I wrote this book after years of volunteering at animal shelters and a spay/neuter clinic. There I saw many people who were completely mystified by their new cat’s behavior. If you’ve never owned a cat before, you may be wondering why on earth your cat does what she does. Cats are individuals with different personalities. Although they may be similar, not every cat behaves in exactly the same way. So your new cat may not be like a friend’s cat or one you had when you were growing up. You may have adopted a “scaredy cat” who doesn’t want to come out from under the bed or a big bold cat who tries to take charge of everything and everyone. The way you should respond to these two very different feline personalities is not the same. Plus when you first bring her home, the cat has suddenly been dropped into completely unfamiliar environment where she doesn’t know anyone, anything, or any of the household rules. Your house may be very different from your cat’s last home. have spent their entire lives outside, so they have no idea what a litter box is, much less where it is. have spent weeks cowering in the back of a noisy metal cage, wondering what happened. never have seen stairs, vacuum cleaners, other pets like dogs, gerbils, or birds, children, men, other cats, chickens, or other household things you take for granted. The truth is, in many cases, you have no clue as to an adopted cat’s past. And the cat isn’t telling. Your cat doesn’t realize you are going to be a big part of his new life and you don’t know the cat’s personality. Trust hasn’t been established yet. Developing a relationship takes time, but it really is possible for a scared, unhappy cat to become a confident, well-adjusted loving companion that everyone enjoys being around. You just need a little guidance and information. The type of information you find in Happy Tabby. New pet owners have many of the same communication problems parents do. Many parents complain about their “obnoxious teenagers who “never listen.” Cats pay attention to you, but generally, much like the rebellious teenager, it’s unlikely you’re going to convince a cat to do anything that’s not his idea. It should be obvious, but trying to “train” a cat like a dog or expecting a cat to act in any human way is unfair. For example, your cat does not run away or scratch the furniture out of spite or to be “mean.” A cat does many things because of instinct and nature. Cats pay attention to results. Sometimes cat owners don’t realize what they are really “teaching” their cats. When your cat jumps on the bed in the wee hours of the morning and demands to be fed, what do you do? If you get up and and feed her, think about what you just “taught” your cat! 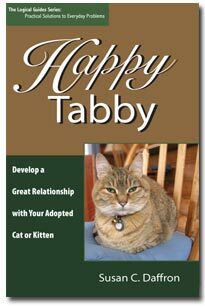 Happy Tabby is filled with practical tips and techniques for average cat owners like you and me. I don’t expect you to suddenly become a world-famous cat trainer by reading this book. However, by becoming a more understanding and informed pet owner, you can enjoy your life with your cat a whole lot more. This book also gives you advice on when it’s time to seek professional help. If your cat has gotten into something potentially dangerous, or is exhibiting signs of illness, Happy Tabby tells you when it’s time to call to get help with your specific situation. Cats are motivated by a few simple things. Understanding how your cat views the world is your first step toward developing a great relationship with your new cat. With only a few strategies and techniques you can ensure the relationship you develop with your cat is positive. After all, the goal for your life together is peaceful coexistence, not a household full of people yelling at the cat. Five reasons a cat may avoid the litter box, and why having more than one cat can “change all the rules” when it comes to litter box behavior. Reasons why neutering or spaying your cat actually makes him or her a better family pet – and a lot healthier and happier, too! Four alternative cat toys that are completely free (and that many cats just adore). Four vaccinations every cat should receive to prevent serious illness, and one “shot” that only outdoor cats may need. Three primary reasons cats scratch furniture, and how you can teach even a tiny kitten that the kitty tree is “the place” to sharpen her claws. Right now my life with my two tabbies is peaceful, but it isn’t always. Periodically, while I’m working at my computer downstairs, I hear great thumping noises from upstairs as the kitties run around chasing each other. Even my 15 year old cat Alia has enough “get up and go” to keep little Troi in her place. Not all cats are good mousers. We have set up mouse traps under the stove because our cats chase mice, but don’t “finish” the job. When we see a cat staring at the stove, we know what has transpired. Cats break stuff. Alia has broken shot glasses, vases, and various pieces of ceramic pottery. The sound of crashing is generally followed by the sound of small paws running. When I was volunteering at the animal shelter, we shared a lot of “dog and cat stories.” The manager encouraged me to start writing public service columns for the local newspaper on pet care because at the shelter, we fielded the same questions over and over. People I didn’t know started complimenting me about the “pet articles” in the newspaper, so I started putting them online as a permanent archive. Many people contacted me through the site asking questions, and rescue groups started asking me for permission to reprint the articles. Now many hundreds of articles and questions later, I’ve compiled all the information I learned into a book that is just for people adopting cats. Many pet books focus on dogs, not cats. When I volunteered at the shelter and was writing columns, the manager always said “don’t forget about the cats!” Many cat books talk about veterinary issues or feeding, but don’t discuss behavior. With Happy Tabby, you’ll never be left feeling like your cat is “really different” from anything you’ve read. I know every cat is special, but I also know no cat is perfect. Get off on the right “paw” when you adopt your new cat. The first days after you bring home your cat can be critical to your future relationship. Retain the peace among your kids, people, dogs, and the new cat with information on how to encourage good interspecies behavior. Figure out what motivates your cat and communicate with her in ways she understands, along with tips for humane and effective ways to discourage behaviors you don’t want. Deal with aggression and clawing, with tips for teaching your kids the best ways to handle and approach cats. Tell whether that “hack hack” noise is a hairball or a more serious problem that requires veterinary help. Plus, a few ways you can reduce your kitty’s tendency to upchuck in the first place. Ensure your cat uses the litter box (and not the rest of your house) with tips for choosing the right kitty litter for your cat and litter box placement. Keep your cat safe from common household and environmental hazards, such as plants, power cords, and other items you would never guess would be interesting to a cat (but they are). Determine when it actually may make sense to adopt more than one cat and how to introduce a new cat into a house that already has felines in residence. You’ll find that unlike breed-specific or veterinary books, Happy Tabby has information that is specifically tailored to the special needs and issues related to living with a rescued cat or kitten. Learn More About Your Cat Now! If you are curious what’s included in the book, check out a PDF file that contains the table of contents and part of the first chapter. Note that because it’s a PDF file, you need the free Acrobat Reader to view it. I believe pretty much everyone who loves animals and shares their life with a feline wants the relationship they have with their cat to be a good one. Let’s face it, the “pet adoption option” isn’t always easy. But Happy Tabby will show you how you can raise a cat who will shower you with companionship and love for years to come. Decide which cat out of all of the ones at the shelter is the right one for you, along with a information about different breeds and colors. Deal with common behavior problems such as clawing, scratching, litter box issues, marking and more. Subscribe with the form below to receive an email notice when Logical Expressions releases a new book!